- The Eagles welcome the Crusaders back to Conte Forum for the second time this season, looking to close out a regular season sweep before facing off against Harvard in the opening round of the Beanpot Tournament on Tuesday. The Eagles are in search of their fourth straight Beanpot title. - Boston College is currently riding a five-game winning streak. Most recently, they took four points in Hockey East play during a home-and-home series with Providence, defeating the Friars, 4-2, in each game. - Megan Keller (Farmington Hills, Mich.) earned Hockey East Player of the Week honors after netting one goal and dishing out four assists on the weekend. The senior tied the Hockey East single-season goals record for a defenseman (13) and posted a new single-season point record for Hockey East blueliners (31) with her effort. - Holy Cross will take on the Eagles on Friday night, before hosting the Catamounts for their first meeting of the year. The Crusaders are coming off of a weekend that saw them drop both games of a home and home series with New Hampshire, falling 4-1 and 3-1. Sophomore Katie MacCuaig (Massena, N.Y.) scored her first goal of the season in Saturday's loss. - Merrimack and Providence meet for the final time in regular season Hockey East play on Friday afternoon, before the Friars close out their three-game series with UConn on Saturday. Providence currently holds a 2-0-0 advantage over the Warriors and are locked up at 1-1-0 with the Huskies. - The Warriors head into their only game of the weekend after taking one point from Boston University in a home and home series last weekend. They dropped game one on the road 6-3, before playing to a 3-3 overtime draw on home ice. - Katelyn Rae (Courtice, Ont.) became the first player in Merrimack College hockey history to eclipse the 100 point mark in the Terriers' series. The senior notched an assist on Friday night to hit the milestone, before going on to add a goal and an assist in Saturday's tie. - Providence will look to put a stop to a three-game skid after dropping their two most recent outings in a home and home battle with Boston College. They fell by a score of 4-2 in each game with the Eagles. - UConn ended a three-game slide over the weekend when they played Maine to a scoreless stalemate on Saturday afternoon, after falling to the Black Bears, 5-1, on Friday. The two teams split their regular season series, each posting a 1-1-1 record through three games. - Morgan Fisher (Vernon, Conn.) earned her third shutout of the year on Saturday, turning away 33 Maine attempts, including five in overtime to help the Huskies earn one point in Hockey East play. She dueled Maine junior Carly Jackson (Amherst, N.S.) who posted a 21-save shutout of her own. - Boston University looks to take the regular season series from Vermont when they meet for the final time on Friday evening, before the Terriers take on Northeastern in the opening round of the Beanpot Tournament on Tuesday at Harvard. The Terriers currently hold the season advantage over the Catamounts with a 1-0-1 record through their first two meetings. - Tuesday will mark the fourth meeting between the Terriers and Huskies this season, but their first in the Beanpot since the opening round of the 2016 tournament that saw Northeastern advance to the championship game with a 3-2 victory. - The Terriers head into the weekend riding a seven-game unbeaten streak dating back to Jan. 6. In their most recent outings, the Terriers defeated Merrimack, 6-3, before playing to a 3-3 overtime draw in their second tilt. BU is 6-0-1 during its current unbeaten run. - Sammy Davis (Pembroke, Mass.) posted four points (2g, 2a) on the weekend, including the game-tying goal with just over a minute to go in regulation to force the extra frame on Saturday. - Northeastern comes into this weekend after winning four points in a two-game home stand with Vermont. They defeated the Catamounts, 2-1, in overtime on Friday, before skating away with a 5-1 victory on Saturday. The two wins sealed a regular series sweep for the Huskies, and put them within one win of securing home ice advantage in the Women's Hockey East Tournament quarterfinals. - Sophomore Skylar Fontaine (East Greenwich, R.I.) earned Hockey East Defensive Player of the Week honors after posting a goal and two assists on the weekend. The defenseman found the back of the net with just three minutes to go in regulation to force the overtime period on Friday. - The Catamounts will close out their regular season series with the Terriers on Friday afternoon, before facing off against Holy Cross in their first of three regular season meetings on Sunday. They head into the weekend off of a two-game road trip to Northeastern that saw them give up four points in Hockey East action. Vermont battled the Huskies into overtime on Friday before dropping a 5-1 decision on Saturday. - New Hampshire will host Maine for two games to close out their three-game regular season series in Hockey East play. The Black Bears took the first meeting between the two teams on Oct. 26, defeating the Wildcats, 5-3. 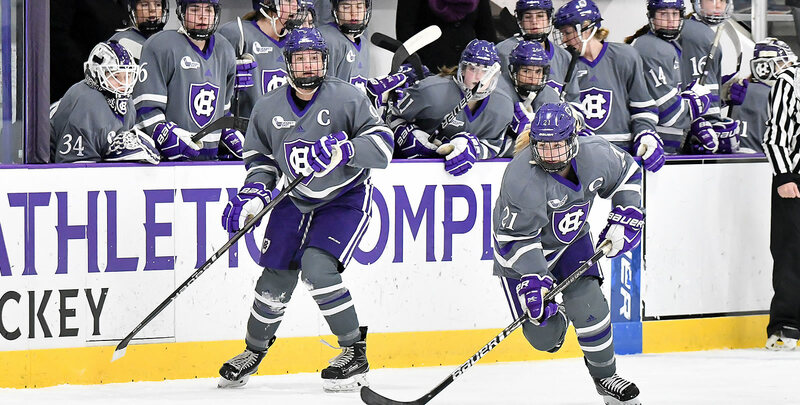 - The Wildcats swept the final two games of their three game series with Holy Cross last weekend, topping the Crusaders, 4-1, at home before skating away with a 3-1 victory on the road. Carlee Turner (Scottsdale, Ariz.) tallied a goal in each victory over the weekend, with Saturday's goal coming on the power play. - Maine is rolling off of a three-point weekend in Hockey East play after defeating UConn, 5-1, in their first meeting before skating to a scoreless draw on Saturday. Freshman forward Celine Tedenby (Ornskoldsvik, Sweden) picked up a career-high four points (2g, 2a) in Friday's victory. She also finished the game with a plus-five rating en route to earning Pro Ambitions Rookie of the Week honors.